General Hospital Poll: Should Jordan Lose Her Job Over Peter’s Escape? VOTE! 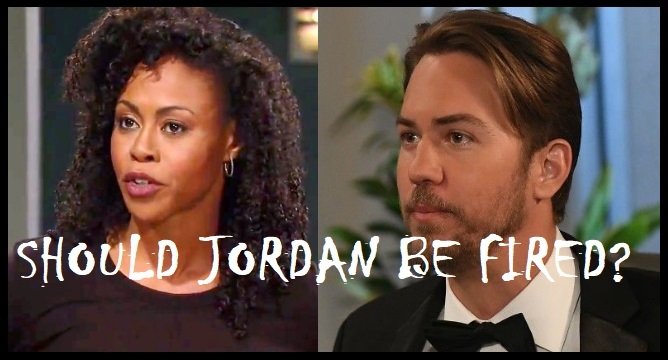 General Hospital spoilers have revealed that Peter August [Wes Ramsey] escaped on Jordan’s watch, however, should Jordan lose her job because of it? Let me begin by saying that I am not a great fan of Jordan’s [Vinessa Antoine] on General Hospital, however, this really is not on her. Honestly, Spinelli [Bradford Anderson] is a huge part of why Peter escaped, and Jason Morgan [Steve Burton] and Sam [Kelly Monaco] were really the ones who provided the means for him to do so. We all know it was unintentional but that doesn’t make it any less their fault. If Sam was not so hell bend on coming to Drew’s [Billy Miller] rescue yet again, she wouldn’t have asked Jason to help Peter escape and the opportunity would not have been presented to allow it. General Hospital’s Peter offered a deal to Drew, NOT Sam, she had no business involved in this. Jason sure should not have been involved and only was because of Sam, he sure didn’t do it for Drew. Valentin Cassadine [James Patrick Stuart] would have gotten Peter out any way he could, however, if Robert Scorpio [Tristan Rogers] had been allowed to take him into custody when he wanted, Peter would have not been in Port Charles. Peter should have never been kept around to offer a deal with Drew and should have been moved the night before. Clearly someone dropped the ball here but without Spinelli’s help, it could have been retrieved rather quickly. Maybe the real problem is, Sam needs to stick to PI work and stop trying to rescue Drew from his own dumb choices. Now we could actually discuss things Jordan Ashford has done that are questionable. If you remember In 2014 when Ava Jerome [Maura West] hit Jake Doe with her car, Jordan lied and took responsibility for that herself. Jake knew that Jordan’s voice was not the one that he recognized from the accident. Jordan still insisted that she hit him and hasn’t told the truth to this day. Jordan also had the nerve to get upset with Sonny Corinthos [Maurice Benard] for taking T.J. in when he wasn’t getting along with her and has been biased against Sonny ever since. Jordan seems to bend over backward to try and get anything on Sonny, yet covers for Ava. It seems that Jordan still holds it against Sonny that Shawn [Sean Blakemore] is in prison. However, Shawn didn’t shoot anybody, no one got hurt at all because of him and Jordan could have covered for the father of her child, yet she didn’t. One would have to wonder if Jordan was more attached to the Jerome family from her time working with them than she would like to admit. It’s rather hard not to question her actions when she shows such bias between the Jeromes and Sonny. The Young and the Restless (YR) News: Mishael Morgan Leaves Y&R – Hilary To Be Recast?